It’s weird to remember that Jason Lutes started his epic during the Clinton administration and has wrapped it up in the age of Trump. Back in 1996 when it began, Berlin read more like a history lesson, using the backdrop of 1930s Germany to explore the rise of fascism when his audience was on the cusp of the 21st century. Berlin could have been viewed then as a reminder of who we were during the 1900s and a warning to not forget the rise of Hitler and the destructive forces of his ideology. Now in 2018, it possibly reads the same way even if it feels like society is forgetting those lessons and what happened in the first half of the 20th century. Lutes’ story maybe hasn’t changed over the years it’s taken to tell it but we have. We’ve become meaner and uglier as Berlin reflects that back at us now in ways that it couldn’t have if it had been completed 20 years, 10 years or even 5 years ago. At the start of the book in 1928, Berlin is a city full of wonder and life. Marthe Müller, a young woman from a small German town, travels to the big city, looking to experience art. On the train, she meets Kurt Severing, a reporter heading home after investigating the German government’s secretive attempts to rebuild its military strength after the restrictions of the Treaty of Versaille. In both people, we see Berlin as a monument to the German spirit and morality. It’s a city of art, politics, and society that seems poised in a post-WW1 world to lead the world. Lutes’ attention to the details of the time also shows just how oblivious people like Marthe and Kurt were to the destructive evil that festered just below the surface of the city. Through his investigations, Kurt was aware that it existed but as Lutes shows throughout the book, he wasn’t prepared how much it would become the culture of Berlin. Kurt is blindsided by the hatred that takes over his city in just a few years’ time. For Marthe, a young country girl, she doesn’t even know that any kind of corruption could exist in humanities’ hearts. Told on layers, Berlin firmly establishing Marthe and Kurt as the two characters who have the most to personally lose in the face of the growing fascist culture because they are among the most privileged in this struggling city. Lutes knows that a city cannot be defined by two people but two people can experience the many aspects of a city. To understand the city of Berlin, you’ve got to see its rich and poor, its establishment and its revolutionaries, its accepted people and its rejects. In developing a deep cast of characters, Lutes examines the effects of the changing Berlin on its people. We see all manners of people at their best and at their worst and understand that for most of them, the truth of who they are is somewhere in between. Some of those stories intersect directly with Marthe and Kurt while others sit on the periphery of the city, almost out of sight but still reflecting the moral crisis of Germany. These layers create a comic that truly deserves to be called a novel. As we journey with these characters between the years 1928 and 1932 (and beyond in a wonderful coda that reminds us that history never stops,) it’s easy to lose sight of the city and its place in history and witness the human nature that gives rise to bullies and dictators. And maybe the opposite is true as well; that we can get lost in the ugliness of the world and forget to appreciate the humanity that exists in most of us. By weaving together this wonderful quilt of lives and experiences, Lutes unveils a microcosm of reality, all of these separate and unique lives that are somehow connected through people, places, and events. For as specific as it is to a time and a place, Berlin wonderfully reminds of the variety of people all around us every day. Some of them are our friends and lovers while others are strangers or even enemies. Charting the political turmoil of the post World War I Germany, Berlin is a densely political book even as one of its main characters is barely cognizant of the conflicts between the Communists, the Nazis, and the republican Germans. As every other character makes decisions based off of politics and loyalties, Marthe experiences a city that seems so much grander than the small town that she came from. As everyone else declares their allegiance to some ideology, Marthe’s ideology is ultimately Berlin itself, a city where all of these events can happen. It allows her to love a man and a woman; it allows her to discover herself regardless of the politics. But Berlin at this time will not allow a young woman to go along without a care in the world. As the reality of the coming conflicts and war begin wearing in on her lovers, Berlin shows its true self to Marthe as it eventually infests everything in it with the ugliness and brutality of the time. The layers of Berlin, the days, months, and years it covers but more importantly the characters it finds in this city, are built on moments and events. Comic pages are the events and their panels are the moments that Lutes uses to sculpt time. Using a very traditional gridded page structure, Lutes’ panels are revelatory in nature. No panel is wasted as he uses every single image in the book to capture defining moments in the life of this city. His clean line and economical choices almost appear plain on the surface as Lutes doesn’t want to call attention to his style or storytelling. But when you get past that simplicity of the image, you can watch how he builds his sequences and uses the comic page to tell this story in ways that no other artistic medium could. Lutes’ architecture of those moments builds on the freedom and oppression that are in constant conflict in the heart of this city. Almost every scene and every panel is character revealing as Lutes’ images show how people like Marthe and Kurt are shaped by the culture that they find themselves in. For Marthe, it’s a freeing experience as she takes on lovers and gets lost in the euphoria of the big city. She’s largely separated from the politics of the time even as her lovers, Kurt, and the boyish Anna, are helpless against the forces of society and Naziism. Lutes’ drawings create this world where Marthe could be isolated somehow from the forces that are tearing the man and woman that she loves apart. It’s limiting to think that Berlin is just Marthe and Kurt’s story. Using the city as his canvas, Lutes creates a tapestry of stories and characters that deeper define the spirit of the city. More than a city of just lovers, Berlin was a city of workers who Lutes uses to explore the changing values of the time. Silvia, a motherless girl who lives on the streets, is more representative of the city than either Kurt of Marthe are. For Silvia, Berlin is the fight for survival. Through her experiences, Lutes demonstrates how the city and country turned parts of their population into revolutionaries. Silvia’s own parents represent the growing divide between people in Berlin and she’s a casualty of that divide. Kurt observes the growing rifts in Berlin, Marthe is largely oblivious to them but Silvia is caught in the fighting, both a victim and a soldier in the war that exists in the streets of Berlin. As it’s taken Jason Lutes around 20 years to complete this classic, his time away from the drawing board has been spent teaching new generations of cartoonists at The Center for Cartoon Studies. For those of us unable to attend his classes, Berlin gives us a master course in the depth and complexity of comics. 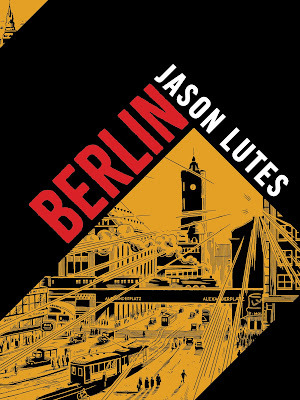 Jason Lutes’ Berlin is far more reflective of 2018 than he could have planned for it to be. While we’re hopefully not on the same destructive path as the citizens of Berlin, it is hard not to see the conflict, the fights, and the people of 80 years ago reflected in our own conflicts today. Maybe Lutes is some kind of prophet and has been warning us of this for the last two decades and we just haven’t listened to him. Maybe the majority of us are Kurt and Marthe, living our lives and setting ourselves up to be blindsided by the inevitable march of history. It sure feels like that is what’s happening right now.